Chinese COSCO Shipping aggressively invests in ports and logistics hubs, writes Nikkei Asian Review and tells about its recent acquisitions of the Spanish port operator Noatum and an inland logistics hub in Khorgos, Kazakhstan. 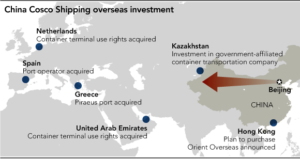 Whereas the Noatum deal has been widely highlighted in the media, including Port.Today, the deal with Kazakhstan’s terminal passed largely unnoticed. Now that the question was brought up by our Asian colleagues, we would like to cast more light on it. Europe. Last year, the company already made several overseas investments as an expansion of its European footprint, acquiring 67% of the Greek port of Piraeus and a 35% stake in Rotterdam’s Euromax container terminal. 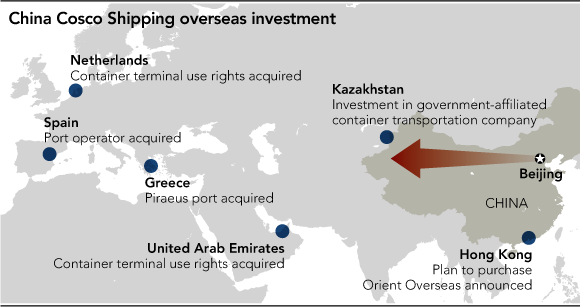 However, the overland Asia-Europe corridor is also within the Chinese focus and that is where the Kazakhstan facility comes in. The dry port KTZE-Khorgos Gateway is located on the Kazakh territory, about 15km from the border with China, in Khorgos-Eastern Gates Special Economic Zone. Due to its favorable location, it evolves into an important transportation hub connecting China to Europe by rail with average transit time of 14-15 days. At the recent TOC Europe 2017 Conference in Amsterdam Karl Gheysen, Vice President Europe Region of KTZ Express owning the facility, has told that since the start of operations in July 2015 KTZE-Khorgos Gateway handled 1240 trains. Among the trains passed through the facility are Chongqing-Duisburg (146 trains), Chengdu-Lodz (67 trains), Zhengzhou-Hamburg (51 trains) and others coming from Chinese ports and inland locations to Germany, Poland, even as far as Spain. As Chinese and Kazakhstan railway tracks have different widths, the cargo needs to be transferred to another train at Khorgos. According to Karl Gheysen, the average transhipment time is just 47 min per full train. Apart from that, the terminal provides logistics, warehousing and storage services. On 15 May 2017, COSCO Shipping, Lianyungang Port Holdings Group Co., Ltd. (LPH) and Kazakhstan Temir Zholy (KTZ), the national railway operator of Kazakhstan, signed the three-party share transfer agreement on KTZE-Khorgos Gateway, whereby COSCO Shipping and LPH jointly acquire a 49% stake in the facility, which was originally owned by KTZ. 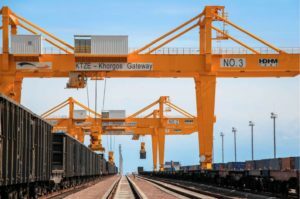 After the acquisition, COSCO Shipping and LPH will hold respectively 24.5% of the shares and KTZ, a Kazakhstan government-affiliated railway company, will remain KTZE-Khorgos Gateway’s top shareholder. According to Nikkei Asian Review, COSCO Shipping spends USD 38 mln to secure the Kazakh facility. By investing in KTZE-Khorgos Gateway, the Cosco Group intends to utilize it as a logistics hub for transporting Chinese and foreign cargoes arriving at the port of Lianyungang in Jiangsu Province by sea to Europe.